What's the easiest Ironman triathlon bike course? Which is the hardest? From the most recent race data, St. George, UK and Lanzarote are easily toughest, followed by Cozumel, Lake Placid and Wisconsin. Austria, Arizona and Florida are among the fastest courses. Note that outside factors, such as weather, wind, or ability of athletes in the field will influence average times. 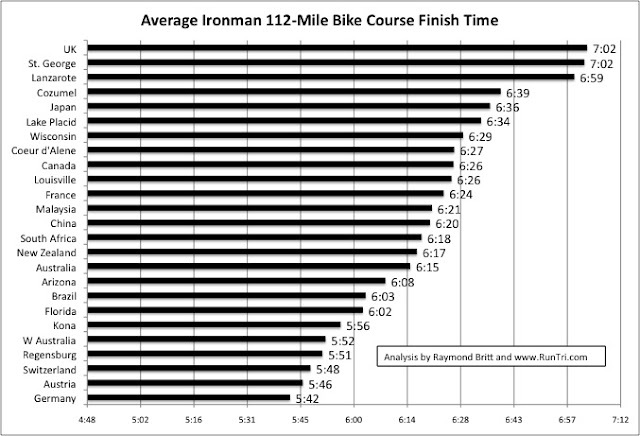 Kona is harder than most, but qualifiers will, naturally, ride faster than most. We think that the Austria time is probably deceptively fast. Unless the course was short or featured tailwinds, having ridden all four, we'd say it's harder than Arizona and Florida, and equivalent to New Zealand. For more, see Bike Splits by Age Division, Average Ironman Run Course Splits and Average Ironman Finish Times.